Conducted by Ben Bolstad with assistance from Arief Gusnanto and Brian Tom. The aim of this session is for you to gain introductory experience with techniques in pre-processing and other techniques in low-level analysis of microarray gene expression data. Because the session for this workshop is fairly short you will note that some sections of these lab instructions are denoted for reference only. This means that the section can be safely skipped to complete the practical. However, they typically contain topics that build on material in the lab, or are useful if you wish to apply these techniques to your own datasets. In other words they are intended for your future use. The first section of practical material will focus on pre-processing techniques as applied to two-color microarrays. Later the lab will explore data from Affymetrix GeneChip microarrays. Although this lab makes extensive use of R and BioConductor you are not expected to have previous knowledge or expertise with these pieces of software. In general, step by step instructions are provided for you to follow. It is expected that you will work at this material in a self-paced manner. Note you may be using a computer which already has the requisite software installed. If so you can safely skip this step and move to the next section. Before you begin you will need to get the requisite software installed on your computer. You will need R-2.2.1 (available from www.r-project.org) and a number of BioConductor (www.bioconductor.org) packages. All the exercises can be done on a computer with 512 MB of RAM (or more, which is the recommended memory requirements), and most of them can be done with as little as 256 MB (which is the minimum required memory). If you are not an expert and are using the Microsoft Windows operating system, the recommended procedure is to use the supplied installer. If you consider yourself an expert, or are using the Linux operating system you should read the instructions in the Appendix. 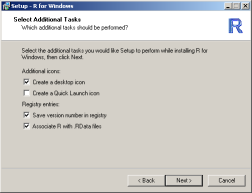 The installer will install R-2.2.1 customized with all the BioConductor packages required for this lab, plus the required datasets. 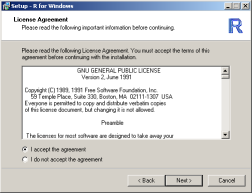 Note that you can safely use this installer even if you have another version of R installed on your computer provided you install this version to a separate directory. You can download the installer at http://bmbolstad.com/PaviaWorkshop/software/WorkshopSetup.exe. After conducting a microarray experiment on one or more arrays printed with a particular library of probes, the arrays are scanned to produce TIFF images, one for each channel (Cy3 and Cy5). The TIFF images are processed using an image analysis program such as ArrayVision, ImaGene, GenePix, QuantArray or SPOT to acquire the red and green foreground and background intensities for each spot, along with other measurements. The spot intensities are then exported from the image analysis program into a series of text files. There should be one file for each array or, in the case of ImaGene, two files for each array. 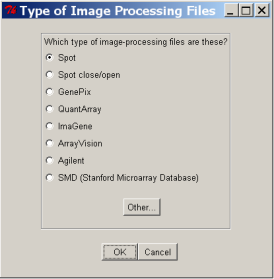 To analyze microarray data, we require (i) a file which describes the probes, often a GenePix Array List (GAL) file, and (ii) the image analysis output files. In most cases it is also desirable to have a Targets File, describing which RNA sample was hybridized to each channel of each array. A further optional file is the Spot Types file (STF) which identifies special probes such as control spots. The Targets File is normally in tab-delimited text format. It should contain a row for each microarray in your experiment. It should contain a FileName column, giving the file from image-analysis containing raw foreground and background intensities for each slide, a Cy3 column giving the RNA type reverse transcribed and labeled with Cy3 dye for that slide (e.g. Wild Type) and a Cy5 column giving the RNA type reverse transcribed and labeled with Cy5 dye for that slide. For ImaGene files, the FileName column is split into a FileNameCy3 column and a FileNameCy5. As well as the essential columns, you can have a Name column giving an alternative slide name to the default name, "Slide n", where n is the SlideNumber and you can have a Date column, listing the date of the hybridization. Additional columns are allowed, provided that the column names are unique. 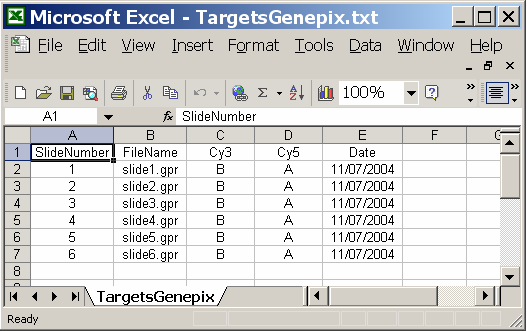 Targets Files can be created in excel or a text editor, and should be saved in Text (Tab Delimited) .txt format. The Spot Types File (STF) is a tab-delimited text file which allows you to identify different types of spots from the gene list. The STF is typically used to distinguish control spots from those corresponding to genes of interest, to distinguish positive from negative controls, ratio from calibration controls and so on. In the first column of this file (named SpotType), names for each class of spot (eg gene, control) on the array should be specified. One or more other columns should have the same names as columns in the gene list file and should contain patterns or regular expressions sufficient to identify the spot-type. Asterisks are wildcards which can represent anything. Be careful to use upper or lower case as appropriate and don't insert any extra spaces. Any other columns are assumed to contain plotting parameters, such as colors (column name Color) or plotting characters (column name cex) to be associated with the different types of points. STF can be created in excel or a text editor, and should be saved in Text (Tab Delimited) .txt format. The STF uses simplified regular expressions to match patterns. For example, 'AA*' means any string starting with 'AA', '*AA' means any code ending with 'AA', 'AA' means exactly these two letters, '*AA*' means any string containing 'AA', 'AA.' means 'AA' followed by exactly one other character and 'AA\.' means exactly 'AA' followed by a period and no other characters. For those familiar with regular expressions, any other regular expressions are allowed but the codes ^ for beginning of string and $ for end of string should be excluded. Note that the patterns are matched sequentially from first to last, so more general patterns should be included first. For example, it is often a good idea to include a default spot-type as the first line in the STF with pattern '*' for all the pattern-matching columns and with default plotting parameters. Background. The experiment was carried out using zebrafish as a model organism to study the early development in vertebrates. Swirl is a point mutant in the BMP2 gene that affects the dorsal/ventral body axis. The main goal of the Swirl experiment is to identify genes with altered expression in the Swirl mutant compared to wild-type zebrafish. On slides 81 and 93, swirl RNA was labeled with green (Cy3) dye and wild type RNA was labeled with red (Cy5) dye. On slides 82 and 94, the labeling was the reversed. Each of the four hybridized arrays was scanned on an Axon scanner to produce a TIFF image, which was then processed using the image analysis software SPOT. The data from the arrays are stored in the four output files listed under FileName. The arrays. The microarrays used in this experiment were printed with 8448 probes (spots), including 768 control spots. The array printer uses a print head with a 4x4 arrangement of print-tips and so the microarrays are partitioned into a 4x4 grid of tip groups. Each grid consists of 22x24 spots that were printed with a single print-tip. 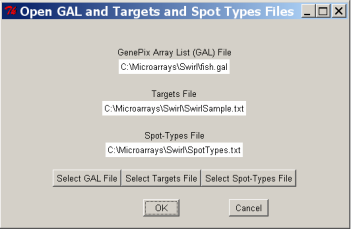 The gene name associated with each spot is recorded in a GenePix Array List (GAL) file named "fish.gal". 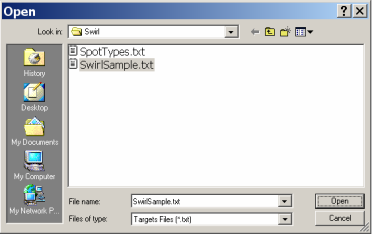 For this example we assume that these files, along with a Targets file ("SwirlSample.txt") and STF ("SpotTypes.txt") are available in the same directory. From the File menu, select "New". You will be asked to choose a working directory. Select the directory containing the Swirl dataset (if you used the installer by default this will be c:\microarrays\swirl) and click OK.
Now you can open a GAL (GenePix Array List) file, an RNA Targets file (listing the hybridizations), and a Spot Types file. Clicking on the "Select GAL File" button gives the following dialog. 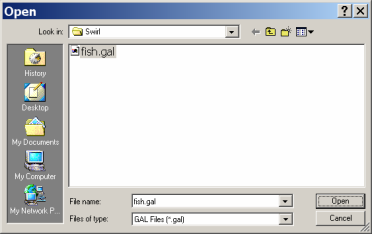 Open "fish.gal". Now click on the "Select Targets" file button to open the RNA Targets file. 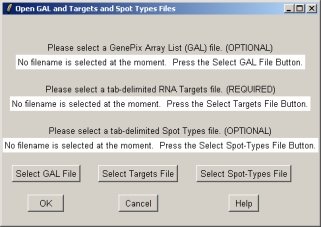 Once the GAL, Targets and Spot Types files have been selected, click OK.
Now select the type of image-processing file listed in the RNA Targets file ("Spot") and click OK.
For Spot files, using background correction is highly recommended (choose Yes). 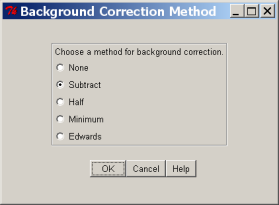 A number of background correction methods are available. Subtract will be used for this dataset. For the Swirl data set, we will not use any spot quality weighting, so click No. 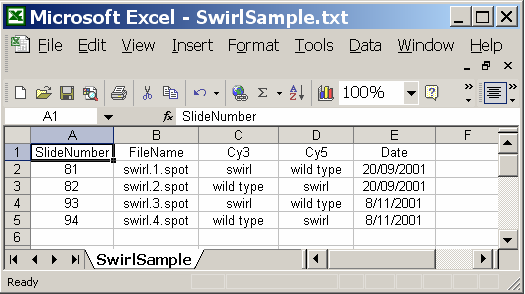 When prompted for a name for this data set, type in "Swirl". Once the data set has been loaded, its name is displayed on top of the left status window. The status window shows that Red and Green background-corrected intensities (R and G) have been loaded, and that there is no spot-quality weighting. The data set name can be later modified with the "Data Set Name" button. The data set name is not the same as the file name, displayed in the title bar. For example, the same data set (Swirl) could be saved at two different stages of the analysis, e.g. 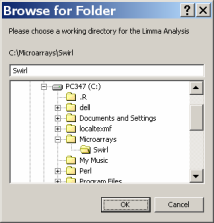 SwirlArraysLoaded.lma and SwirlLinearModelComputed.lma. Now we can check that the Targets have been read in correctly. From the RNA Targets menu, click on "RNA Targets" to display the information in a table. 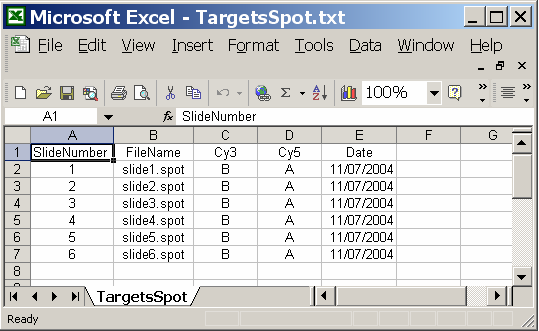 An Edit menu is provided to allow the user to copy the Targets table to the clipboard. The Spot Types table can viewed from within limmaGUI in a similar manner. Unlike the RNA Targets table, the Spot Types table is actually editable within limmaGUI. You can change the default colors associated with each spot type and you can even create new spot types and save the table to a tab-delimited text file. The arrow keys can be used to select the active cell in the table, while holding down Control and using the arrow keys will move the cursor within the text in one cell. The Rows menu can be used to add or delete spot types. The layout should also be checked by selecting the "Layout Parameters" menu item from the Layout menu. 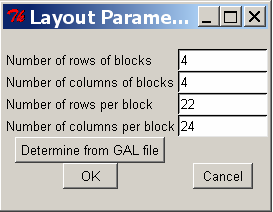 A dialog box with the number of rows and columns of blocks on an array and rows and columns of spots in each block will be displayed. 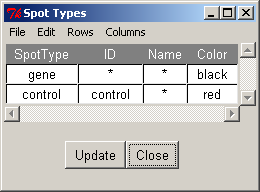 If these values are appropriate, click OK.
Once the data has been loaded, various diagnostic plots can be generated by choosing an appropriate option from the Plot menu. Plot > Image Array Plot > Choose a slide: "Slide81" > OK > Choose which variable to plot: "R" > OK > Plot title: "Image array plot of R for Slide 81" > OK.
An image plot should be displayed in another window. The top left of the array is on the bottom left of the plot, which represents a counter-clockwise rotation of 90 degrees. We can see a bright streak across the middle two grids of the 3rd row caused by a scratch or dust on the array. Spots which are affected by this artifact will have suspect M-values. The streak also shows up as brighter regions in the image plots for the background. Clicking on a particular spot on this image will bring up a window displaying its ID information retrieved from the GAL file. Other variables which may be plotted in this way include "Mraw" and "Araw", for un-normalized M and A values, "G" for green foreground and "Rb" and "Gb" for red and green background. Plot > M A Plot with lowess curves (for one slide) > Choose a slide: "Slide81" > OK > Normalization Within A Single Array: No > Lowess Curve(s) Options: "Print-Tip Group Lowess Curves" > OK > Plot title: "M A Plot for slide 81 with no normalization" > OK. Plot > Print-Tip Group M A Plot (for one slide) > Choose a slide: "Slide81" > OK.
You should be able to notice the points which make up the red streak (Note: this plot is not rotated). The affected spots are in grids 10 and 11, and have very large positive M values at high intensities. 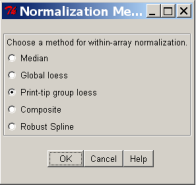 a dialog box with various normalization options is displayed, as below. 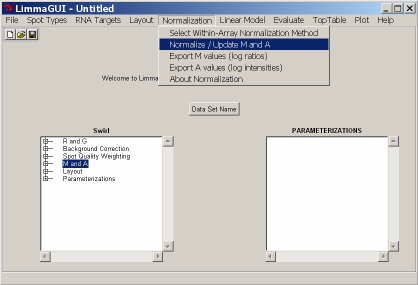 Print-tip group loess normalization is the default method, and will be used for this data. Click OK.
Dialog boxes which ask whether you'd like to "Normalize Within Arrays" (choose Yes) and "Normalize Between Arrays" (choose No) should follow. Now check the status window to see that "Within-Array Normalized" M and A values are available. Try generating an MA plot of the normalized values, with the control spots highlighted (Hint: Plot > Color-Coded M A Plot (for one slide)). To read in the intensity data, the function read.maimages is used. 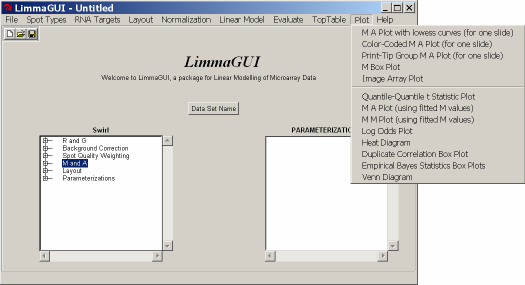 The default for SPOT output is that Rmean and Gmean columns of each file are used as foreground intensities and morphR and morphG are used as background intensities. The object RG is an RGList object which contains a foreground and background intensity for each of the red and green channels for every gene (spot) on every array. To see a summary of the contents of this object, simply type its name and press enter. MA-plots. The M and A values can be calculated using the function normalizeWithinArrays. The option method="none" calculates raw (un-normalized) M and A values. By incrementing the array argument (eg array=2), MA plots for other slides can be generated. In this exercise we consider an experiment where two RNA sources are compared directly on 6 replicate arrays. Background. This data is taken from a set of quality control hybridizations, which were performed to assess how well the spots were printed on the arrays, rather than a question of biological interest. The RNA compared was from two very different cell lines, which ensured many of the genes were differentially expressed at varying degrees. Data for each slide is available from two image analysis packages (GenePix and SPOT), and will be used to highlight some of the differences between the programs, particularly in terms of the background levels measured for each spot. The hybridizations. Six microarrays were each hybridized with RNA from cell line A (Cy5) and cell line B (Cy3). The arrays. A total of 10944 spots were printed on each array. They were arranged in 6x4 print-tip grids, each containing 19x24 rows and columns of spots. The Lucidea Universal ScoreCard controls (Samartzidou et al, 2001) were printed on the arrays, and spiked into the RNA mixes of each experiment. This control series is made up of artificial genes, some of which are added in equal quantities, or at 3 and 10 times as much in one sample compared to the other to give known fold-changes for particular spots. for the GenePix data. Files named "TargetsSpot.txt" and "TargetsGenePix.txt" are included in the zip file for the cell line data. A STF named "SpotTypes.txt" is included in the zip file for the cell line data. The foreground intensities are stored in RGspot$R (Cy5) and RGspot$G (Cy3) and the backgrounds are stored in RGspot$Rb (Cy5) and RGspot$Gb (Cy3). This information is read in from a file in the current working directory with an extension .gal. If no such file, or multiple files with this extension exist, an error message will be generated. Now all of the necessary information is stored in the RGList object, RGspot. 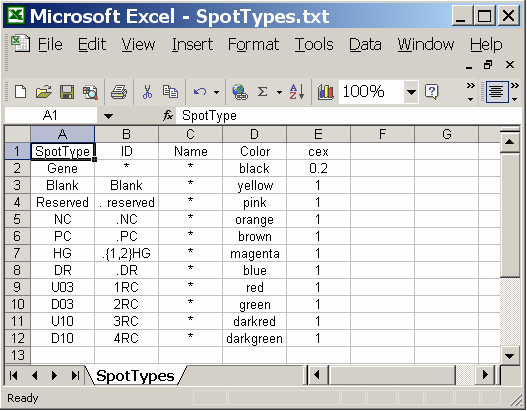 View a summary of the contents of RGspot by typing its name and pressing enter. The default for GenePix output is that the F635 Mean (Cy5) and F532 Mean (Cy3) columns of each .gpr file are used as foreground intensities and B635 Median (Cy5) and B532 Median (Cy3) are used as background intensities. for GenePix data. In this case, the order of the files in the working directory (which depends on their names) will determine the order they are read in. A benefit of using a targets file is that the order is controlled by the user. The targets file can also be used later in the linear modeling analysis to set up the design matrix. Assigning the gene ID's, control status of the spots and the printer layout will need to be repeated as before. The pattern argument of the dir function accepts a regular expression. A detailed understanding of regular expressions is certainly not required to perform basic microarray analysis. The double backslash (\\) tells R that the dot immediately after it should be treated literally as a dot rather than as a special character (as it normally would be in regular expressions). The dollar sign ($) tells R that not only must the file names contain the pattern ".spot" (or ".gpr"), but they must in fact end with ".spot" (or ".gpr"). Un-normalized M and A values for each spot can be constructed using the function MA.RG. Notice the automatic highlighting of the control spots specified in the STF. To do the same plot for other arrays, the array argument can be changed. then proceed as before to normalize the data, using RGgprnobg instead of RGgpr. For some other diagnostic plots, try the following functions from the arrayQuality library. For each slide, a summary diagnostic plot "diagPlot.<slidename>.png" will be saved in the working directory. Each slide summary shows MA plots, image plots of M (before and after normalization) and A values, dot plots of the M and A values for each class of control spot (provided controlCode is set correctly), as well as single channel intensity plots. These plots allow the overall quality of a slide to be assessed visually. The arrayQuality package can also provide a more quantitative measurement of slide quality by comparing each slide to a set of reference slides, where available (not applicable for this example). This lab introduces the basic tools provided for the low-level analysis of Affymetrix data. By the end of this lab you should be able to perform basic inspection of Affymetrix datasets, process raw data to produce expression measures and assess the quality of the arrays. which in this case contains sample numbers and the original filenames (in this lab the 6 arrays are referred to using the first 6 letters of the alphabet) for this data. to see the probe-intensity behavior for the probeset across Probe Number and across Array Number. shows some of this information for the jsmHyperdip data. would read in 3 CEL files and store them in an AffyBatch called my.Data. Examining these two images we see that array B has a clear artifact. gives the histograms for the jsmHyperdip dataset. Most differences in position and spread are typically removed by normalization and do not indicate potential problems. However, histograms that have significantly different shapes are often of lesser quality. In this case we see that the histogram for array B has a shape that is distinctly different from the others. This is the array observed earlier to have a large artifact. shows differences in the spread and center across the arrays. As we shall see momentarily, most of the differences visible on these boxplots are reduced after normalization. You can also use MAplot to produce MAplots where each array is compared to a chosen array in the dataset. For instance, suppose we wanted to compare all the arrays with one particular array. We do this using the ref argument of MAplot in the following manner. And it could be further useful to look at these for only a subset of the arrays. These can be specified using the which argument. All the functions that produce expression values take an AffyBatch object and return an exprSet object. Expression values, phenotypic and other related information are stored in exprSet objects. Routines that produce expression values usually carry out a specific sequence of pre-processing steps: background correction, normalization and finally summarization. A popular expression measure known as RMA is computed using the rma function. shows some of this information for the RMA values computed for the jsmHyperdip dataset. shows this to be true for the RMA expression values we computed. Some users prefer to construct their own expression measure by combining their own sequence of pre-processing steps. Two functions expresso and threestep are available for this purpose. Of the two functions expresso provides slightly greater flexibility while threestep is faster and more memory efficient. For further details on these functions the user is referred to the Vignettes named affy: Built-in Processing Methods and affyPLM: the threestep function. Both can be accessed by typing openVignette() or on the web at http://www.bioconductor.org/viglistingindex.html. For quality assessment purposes we will use the standard errors, weights and residuals stored in the PLMset object. Raw access to these values are available using the se(), weights() and resids() functions. The quality assessment tools are based on visual representations of these quantities. Residuals images are colored so that high positive residuals are red, low negative residuals are blue and residuals close to 0 are white. Look closely at the chip image for array A (you may need to enlarge the graphic window), do you notice anything? The artifact identified on this array is not easily visible in the image of raw probe intensities. to create the plot. You will notice that array B has a discordant boxplot. This indicates it is of poorer quality relative to the rest of the dataset (not surprising given the large artifact). While we also saw a recognizable artifact on array A, because it was of small size, it did not have large appreciable effect on the overall quality of the array. As before, array B has a significantly different boxplot. Probe-level analysis of Affymetrix data is very memory intensive. In general you will be able to handle more arrays with more memory. For this lab most activities should be successfully handled using 512MB of RAM. Note that on Windows operating systems you have some control over the maximum memory available to R. Specifically, by default R will be restricted to the smaller of the amount of physical RAM and 1 GB. The function memory.limit() can be used to alter this limit when R is running. Command line arguments can be supplied to change these limits at launch time. 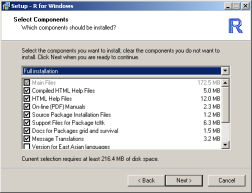 For further details refer to the R for Windows FAQ at http://cran.r-project.org/bin/windows/base/rw-FAQ.html. On Linux and other Unix based operating systems you are not required to set the maximum memory size. Two additional functions, justRMA and justGCRMA are available for computing RMA and GCRMA expression measures respectively. These compute the expression measures directly from CEL files. This makes them much more memory efficient but you will not be able to carry out additional probe-level analysis. Irizarry, RA, Bolstad BM, Collin, F, Cope, LM, Hobbs, B, and, Speed, TP (2003) Summaries of Affymetrix GeneChip Probe Level Data. Nucleic Acids Research. Vol. 31, No. 4 e15: Discusses specific comparisons between RMA, MAS 5.0 and dChip. Wu, Z., Irizarry, R., Gentleman, R., Martinez Murillo, F. Spencer, F. A Model Based Background Adjustment for Oligonucleotide Expression Arrays. Journal of American Statistical Association 99, 909-917 (2004). : Discusses the GCRMA expression measure. Wettenhall, J. M., and Smyth, G. K. (2004). 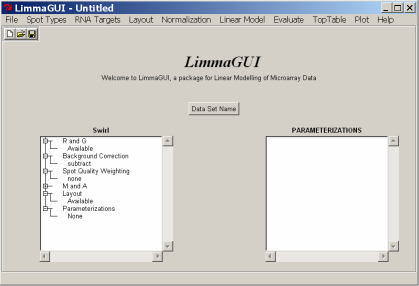 limmaGUI: a graphical user interface for linear modeling of microarray data. Bioinformatics 20, 3705-3706. Yang YH, Dudoit S, Luu P, Lin DM, Peng V, Ngai J, Speed TP. Normalization for cDNA microarray data: a robust composite method addressing single and multiple slide systematic variation. Nucleic Acids Res. 2002 Feb 15;30(4):e15. Dudoit, S., Yang, Y. H., Callow, M. J., Speed, T. P. 2002. Statistical methods for identifying differentially expressed genes in replicated cDNA microarray experiments. Statistica Sinica, 12:111--139. Samartzidou, H., Turner, L., Houts, T., Frome, M., Worley, J., and Albertsen, H. (2001) Lucidea Microarray ScoreCard: An integrated analysis tool for microarray experiments, Life Science News. http://PLMImageGallery.bmbolstad.com/: An image gallery showing chip quality to images for many individual arrays and complete datasets (Affymetrix GeneChips). http://www.stat.berkeley.edu/users/~bolstad/RMAExpress/RMAExpress.html: RMAExpress is a standalone GUI application for computing RMA expression values. http://bioinf.wehi.edu.au/limma/index.html Smyth, G. K., Thorne, N. P. and Wettenhall J. 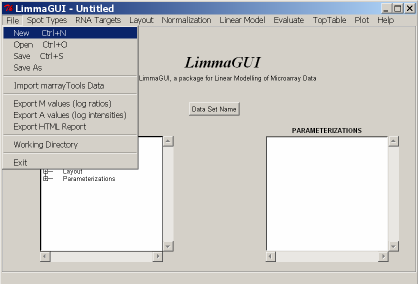 (2004) limma: Linear Models for Microarray Data User's Guide. The Walter and Eliza Hall Institute of Medical Research. Before installing R and the required R packages, you should ensure that you have at least 500 MB of free hard disk space. The installation of this software will not require that much space, but whenever installing large software bundles you should allow for some extra space because filling up your hard disk completely can lead to serious performance problems. If you have an existing R installation, you do not need to replace it if you don't want to. 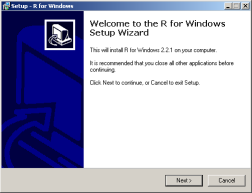 You can install the new version of R in a different directory. Installation should be straightforward as the series of images below demonstrate. 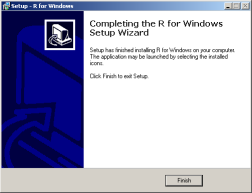 The setup proceeds by first installing the necessary datafiles and then launching a separate installer to install the customized version of R. By default the data files are installed to c:\microarrays. 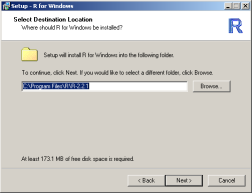 If you have another version of R installed on your computer you may choose to install this version to another location, otherwise the default location is probably ok. Note that the customized version of R provided for this lab should be sufficient for running limmaGUI, although you might notice warning messages. This can be fixed by installing ActiveTcl from: http://www.ActiveState.com/ActiveTcl. 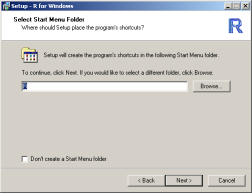 You will need to do this if you choose to manually create your own installation rather than using the supplied installer. 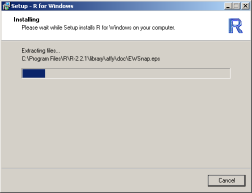 First you will need to retrieve and install R from www.r-project.org. Pre-compiled versions are provided for Microsoft Windows operating systems and you can download source code for Linux and other Unix operating systems. You will also need the jsmHyperdip package which contains a small Affymetrix dataset. You must install this manually. For windows download jsmHyperdip_1.0.zip. For linux/unix operating systems jsmHyperdip_1.0.tar.gz. 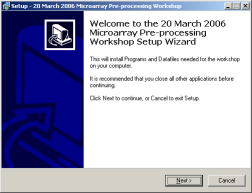 Finally, you will need to download the required microarray data files. You should unzip these and place them in an accessible directory (the pre-customized bundle tries to install these in c:\microarray by default. Specifically, download swirl.zip and CellLine.zip. Portions of the section on two-color microarray data were previously used by James Westenhall, Matt Ritchie and Gordon Smyth for previous workshops.